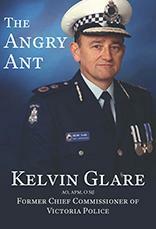 Kelvin (Kel) Glare AO, APM was Victorian Police Chief Commissioner between 1987 and 1992. This is Kel's life story. Kel joined the Victoria Police on 10 May 1957. After serving in uniform in a number of Stations, Kel transferred to the Fingerprint Bureau in January 1960, serving for almost six years and becoming a Fingerprint Expert. In 1966 Kel became a Detective, and whilst working in this role, commenced to study for higher education completing the matriculation certificate by correspondence. Promoted to Sergeant, and later a transfer by invitation to a new Court presenting committal for trial cases to a Magistrate saw Kel, complete his Bachelor of Laws Degree with Honours (LL.B. (Hons) at the University of Melbourne and was admitted to practice as a Barrister and Solicitor of the Supreme Court of Victoria on 2 November 1977. A transfer Promotion to Senior Sergeant followed and a further promotion to Inspector saw Kel take charge of No. 1 Division of the Gippsland Police District with control of seven police stations and 183 personnel. In 1981 a further promotion to Chief Inspector resulted in Kel being given the task of creating a Prosecutions Division for the Victoria Police with responsibility to create a Prosecutors’ Course to select and train Police Prosecutors and run the day to day operations of the Division. In August 1984 Kel was appointed as the First Assistant Commissioner, Internal Investigations Department. In 1986 promotion to Deputy Commissioner, Operations, saw Kel take charge of all uniformed, traffic police and detectives in Victoria. Kel served as the Chief Commissioner of the Victoria Police from November 1987 to November 1992. Hi there. I'm afraid this title isn't available yet as an e-book and the author has not made plans to make it available in electronic form. Thanks for your inquiry.